Construction industry depends on equipment and machinery to a significant extent. Most construction tasks require more than only one machine or tool, in order be done quicker and easier. One of the most important and versatile piece of construction equipment is the excavator. The excavator is versatile by itself, but it has the ability to be matched with a variety of excavator attachments. With this ability, the excavator is able to perform a thousands of different tasks with a specific excavator attachment. The excavator attachments have been designed to assist the construction industry in getting things done easier and quicker, which they do perfectly. Now, let’s explore the most commonly used excavator attachments in the construction industry. Excavator Bucket – Excavator bucket is the most popular attachment for excavators. The excavator bucket comes in many different sizes, shapes and forms, and each type of bucket is used for specific applications, such as sorting, loading, digging, mining, mulching, etc. This attachment is able to dig through any type of surface and is essential for most tasks in the construction industry. Blade – Another one of the most commonly used excavator attachments is the excavator blade. This attachments helps in leveling and grading ground, sand, soil and dirt by pushing and moving large amounts of materials from it. Not only leveling and grading, but an excavator with blade is efficient for moving light, medium or heavy materials from one to another place. Breaker – The breaker attachment is also one of the more popular excavator attachments and it is essential for the construction industry, because it enables the excavators to break up materials of different hardness. The most suitable and cost-efficient attachment for breaking and demolition works is the excavator breaker. Excavator Auger – Excavator auger is another widely used excavator attachment. It is used for various digging applications, as it provides the excavator with incredible digging ability. Also, the excavator auger increases the outreach and provides the excavator with additional flexibility. These are not all, there are many more excavator attachments that can increase the usage of excavators in construction applications. 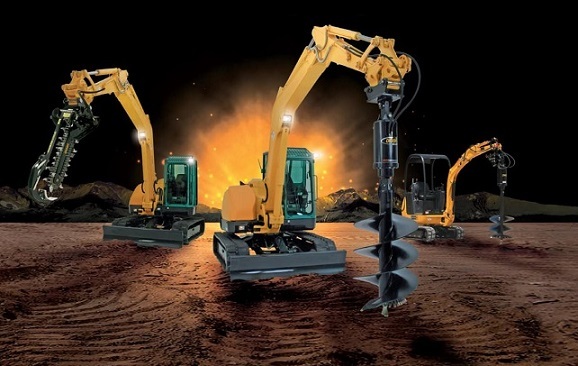 When these excavator attachments are used in construction industry, they bring many advantages, including: faster performed operations, reduced labor, increased business profits and increased productivity of companies. So, the companies need to make an extensive research before buying only the well-suiting excavator attachments for their specific construction operations.